We recently reissued our GoDaddy wildcard cert with the SHA256 signing algorithm (FYI they still revoke the old cert in 72 hours even if you don't re-key it, so you should re-key anyway). We use this cert for our RemoteApps, Terminal Servers' RDP, RDGateway, and RDWeb (IIS). 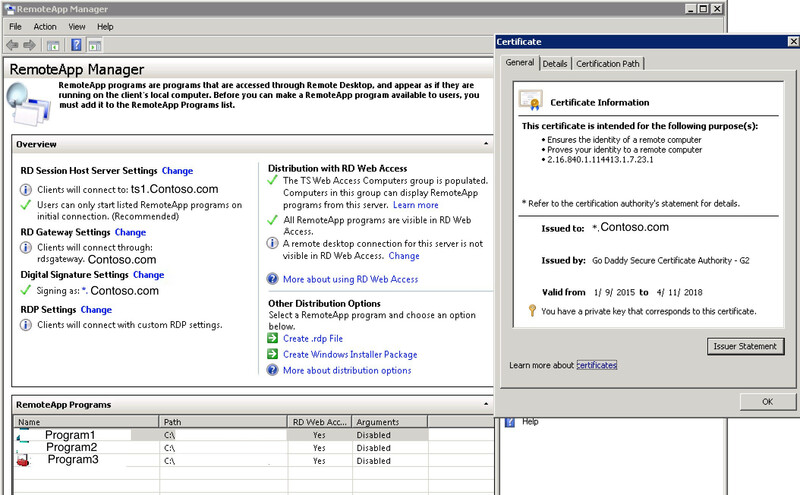 When I change to the new wildcard certificate in the "RemoteApp Manager"->"Digital Signature Settings" on a given Terminal Server (AKA Session Host server) Connections from RDWeb for apps published on that terminal server fail for some users, but connections using the a .rdp file work fine for all users. Furthermore, and this is the strangest thing I have ever seen, the wrong user is logged as being denied access at the gateway. If I change the certificate back to the old, revoked cert for this one setting, then everything works. The user "CONTOSO\alice", on client computer "123.123.123.123", did not meet resource authorization policy requirements and was therefore not authorized to resource "ts1.contoso.com". The following error occurred: "23002". What is going on? Why does changing the RemoteApp's signing cert cause the gateway to think this is a different user connecting? Found this page after experiencing the same problem. For us the solution was to add port 3389 to loopback (aka Hairpin NAT) on our firewall. Replacing the certificate was trickier than installing it the first time, but I think we did it correctly, and apps worked fine for a day or two. Users started getting errors on launch, and we wound up using the powershell script here https://gallery.technet.microsoft.com/Change-published-FQDN-for-2a029b80 to re-publish the FQDN of the server. I think this script must have set the FQDN in a part of the config that had never been specified before, causing the RD Gateway to refer to itself by its FQDN to hand off requests. These requests failed as our edge firewall allowed only 80 and 443 for both incoming and loopback requests. Adding port 3389 to the loopback rule on the firewall resolved the problem immediately. Not the answer you're looking for? Browse other questions tagged certificate remote-desktop-services windows-terminal-services rdweb or ask your own question. When to use self-signed certificate with RDWeb?